I write this off line. The connection was allowed then 5 seconds later it was cut. Getting to Brazil was easy the getting from Sao Paulo was the difficult part, well the extended part. The airport reminded me slightly of Thailand, below power lighting and feeling of stepping back into the 80's. Exposed walls, and computer message boards that were blank. It easy enough going through immigration, collecting my bags then out the exit to check into the flight to Salvador. There was not hoards of hustlers waiting to grab your bags and take you to a hotel that you did not want to go to. No none of this happened, I just walked across to the departures desk for the TaM my choice of carrier to Salvador. The chosen one because they had a flight that fitted my arrival time and I could pay for the flight as they had a London desk, they have a number of desks around the world. Check in was painless. Isabel told me that I managed to get the last window seat, lucky me. Made my way through security. Boarding was at 21:20, and take off would be 21:59. That would be a hours wait. Then over the distorted sound system notice was given in Brazilian, luckily in English as well, that boarding would be at 11pm. As the plane had arrived late, would take off late. The gate would be 1A. They had decided to use the information screens so I could see my flight, the number and destination was correct but the time was in the past for the time of take off. Welcome to Brazil, lets samba around the airport while we wait. Anyway I had a good book with me to read, “When We Were Orphans” by Kazuo Ishiguro. Started reading the book on the flight over from Paris. The food has so never matched the food that I ate on Air France when I flew from Edinburgh to Paris, and then onto Tokyo. Who has ever had good food on a city link flight, well I did. It must have been a one off. Food still beter than the KLM flight from Edinburgh to Gotenburg, where they through bred roles to the masses. So at last I had a great book to read. My last holiday read was the pits, “ The devil wares Prada” When I first sow a poster for the movie in HK I wanted to see it. Title like that the movie must be good and the book must be a riveting read into the fashion world. How wrong I was, the film was better than the book. The book was just a flaccid. The story line was contrived, the author could not be bothered to do a proper job with the story line, because she had no idea how to write a book. Mateen was correct, it was boring but I had to see it through to the better end. Which I must do with books, I just must finish them. How much effort it must takes, the toom must be finished. Anyway the producers must have bought the rights to the movie to use the title. It is so shocking to see that most book shops have her book at 1 or 3. Who is laugh now, not me. Still in pain over that book, no justice in the world. So at last I had a good holiday read and sometime to spend before boarding the flight. So I settled down to read , keeping an eye on the notice board. The lists of flights grew as the number of people waiting increased. Then my flight disappeared from the screen, shock, had I missed something with all the other announcements going on. So lose my seat and go up to the desk and ask the young women at the desk about my flight. The flight would now leave at 1C, and she did not know the boarding time. Jings bings, Daniel will be waiting for me, the scheduled arrival time was 11:25. Better phone hime. I could not get through, I tried a number of combinations. Taking of the ID code 55 for Brazil, inserted a 0, then took of the double 1, and the added a zero. I tried all possible combinations. Just could not get through. Turns out his phone had run out of credits, so I could not phone. Then my flight was announced , the gate was now 1B. No problem, as 1B gate was next to 1C. The departure lounge was now full, people sitting on the floor. I must say though even though everyone was waiting for there delayed take off time, as other flights had been delayed as well, everyone was good mannered no latino hysterics. Then the mass exodus happened, why was everyone moving. I could hear that it was something to do with the 3156, Salvador flight. Just had to hold on for the English. Gate had been changed to 5. So I joined the exodus to the Gate 5. In less than 45 minutes we would board and then we would be on our way to Salvador. Why were people queuing for a flight that would in 45 minutes time. Silly people. Anyway we boarded, decided to join the queue, rather do my usual and let the people go in. So I found 11A, someone was sitting there. Now I understood why people were queue well before boarding time. In Brazil they double book seats, and if you are really unlucky the over book the flight. So I sat in 11c, aisle. Watching everyone else match up and down the plane looking for spare seats. Why does TAM not just not do what the budget airlines do Europe and do not assign seats but just allow people to find there own seats. Anyway after 30 minutes of people eventually finding a seat we are all seated. So now it was after 11:00. Then they tell us that we do not know when the flight will take off, as we are in a queue waiting for a slot to take off. As we had missed our slot by the delay in boarding. We waited and waited. They served us cold water, my first taste of Brazilian coffee. Very sweet and black. Considering that I woke up at 3am to get a taxi at 4am to the airport for the 6am flight I was slightly knackered. All I wanted was to get to bed, and there was poor Daniel waiting for me at the other end. After repeated announcements with the same message, still waiting eventually the plane was given the go ahead to take off. Big cheer went up, and hand clapping, and laughter. Brazilian are pretty laid back when it comes to delays, they must be used to it. Seemingly these problems are quite frequent. As Daniel had warned me about other airlines, his sister said TAM was okay. If you want least problems book a VAIG flight. 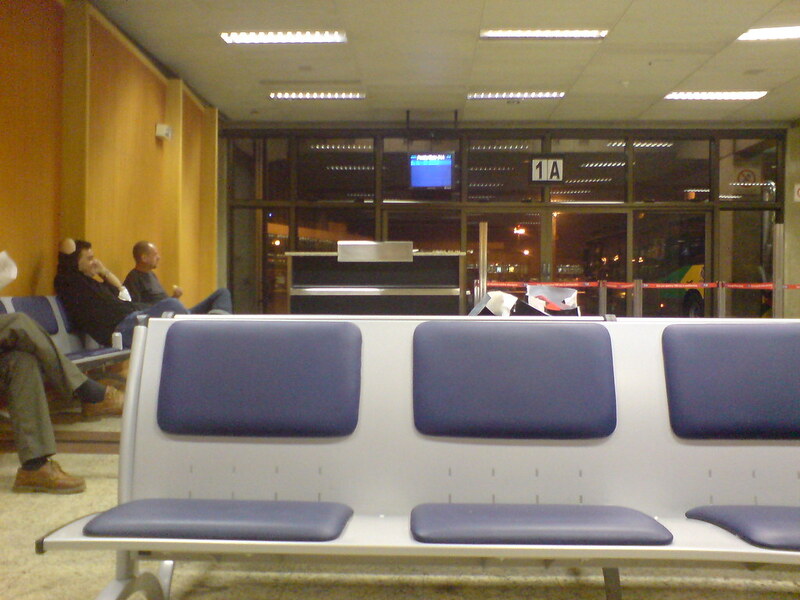 I could not as they flied before I arrived in Sao Paulo, also they only have one flight a day to Salvador. So we were are in the air at 2:30. Which means a 4:30 arrival. I passed out with shear exhaustion. Time was twilight. There was Daniel there waiting for me, go on you my son. Slightly drunk and tired but happy to see me. Not much to do at the airport. Jump in a taxi and get to the resort. Sat up talking over things, got to my bed.